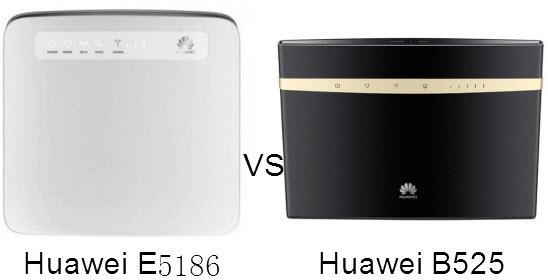 Huawei B525 VS. Huawei E5186? Frankly, for single user who wants to buy Huawei LTE CPE, they usually have the similar question. There are slight differences between Huawei LTE CPEs which normal users cannot discriminate it. For example, the Huawei E5186 and B525 are both LTE CAT6 CPEs. Let’s take a view of the following difference between the E5186 and B525. Huawei B525 is the latest desktop router LTE from Huawei, which is in smaller size than E5186. With the dimension of 163 mm x 52 mm x 226 mm, there are power, Wi-Fi, signal strength, network mode and LAN/WAN indicator at the front panel of the B525. At the back interface of the B525, there are 4 x RJ45 ports for WAN/LAN, 1 x RJ11 port, 1 x USB port and power adapter plug. And there are also two connectors for external antenna. For the Huawei E5186, the dimension is 194 x 177 x 64 mm, and there are power, network mode, WiFi, voice and signal indicators on the front panel. Two external antenna connectors, 4 x RJ45 ports for WAN/LAN, 2 x RJ11 ports for VoLTE and telephone, 1 x USB port for storage and power adapter plug on the back side.